Cayenne pepper has been used to add flavor, color, and a hint of heat to dishes for thousands of years. Some people love it, while others cackle at their heat-intolerant friends who chug water after they secretly doused their food in cayenne. Love it or hate it, there are many benefits to using this ancient spice, with more being discovered all the time. A reader shared with me that his white blood count was higher after using cayenne pepper for some time. This is great news! White blood cells are essential to normal and healthy immune function. They are also known as leukocytes. When you ingest cayenne pepper, it activates the white blood cells to protect your body from attack. There are several different types of white blood cells, but they collectively help your body to defend itself against bacteria, viruses, fungi, parasites, allergens and cancer cells. When they are needed, the white blood cells are also employed to remove dead or damaged tissue and regulate the immune response to keep you healthy. The use of spices in countries with hot climates dates back hundreds, if not thousands, of years. Before refrigeration was invented, people used spices to kill bacteria and pathogens in their food. Capsicums and hot peppers, including cayenne, kill up to 75% of the bacteria they come up against, helping to prevent food-borne illness and death for generations. Capsaicin, the compound in cayenne pepper that makes it hot, has been found to act as a digestive aid. It does this by increasing saliva production, improving gastric motility, and may also stimulate digestive enzyme production. Studies show that capsaicin exhibits anti-inflammatory properties, making it a promising candidate for treating inflammatory diseases and cancer. It inhibits the enzyme activity of specific proteins that may cause these illnesses. Applying cayenne pepper topically can reduce muscle and joint pains significantly. Cayenne has a counter-irritant effect when rubbed on affected area—by causing a mild irritation to the tissue where it is applied, thus distracting from the original more severe joint pain. 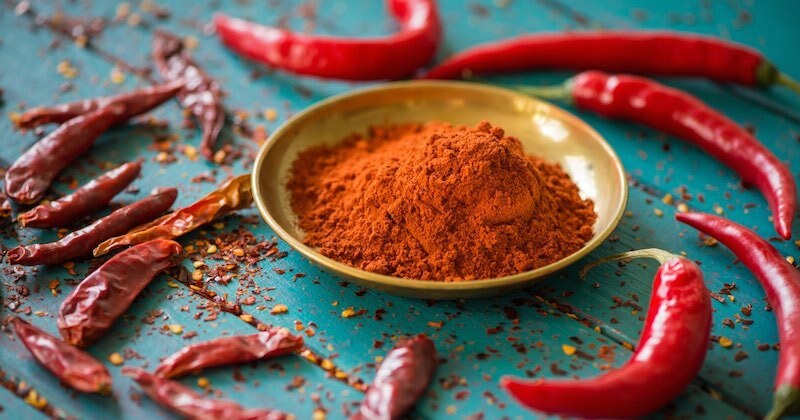 The active ingredient in cayenne—capsaicin—relieves pain by acting on the sensory nerves by hindering the transmission of a neurotransmitter responsible for pain signals in your brain. Try this cayenne pepper pain relief cream. Cayenne pepper and capsaicin have shown to help with a variety of pain, including arthritis, fibromyalgia, pain from skin conditions such as shingles and psoriasis, nerve damage and pain related to diabetes, lower back pain, as well as headaches and chronic migraines. To relief migraine and other pains, add ½ teaspoon of cayenne pepper and 1 tablespoon of apple cider vinegar to a glass of water. Stir and drink it to get an almost instant relief from pain. As soon as cayenne pepper hits your stomach, it will signal your brain to release endorphins that are your body’s natural painkillers. New research shows that capsaicin inhibits stomach acid secretion and stimulates mucus secretions and blood flow to the stomach. It activates neurons in your stomach that signal for protection against injury causing agents, and therefore prevent and help to heal gastric ulcers. Although hot spices have a bad reputation in association with ulcer, the truth is capsaicin has the ability to destroy invasive bacteria in the digestive system and reduce inflammation in the body. It also has the ability to fight the H.Pylori bacteria that cause stomach ulcers. Some studies suggest that cayenne pepper and capsaicin may help to decrease appetite and help you feel fuller, longer. One theory states that capsaicin in cayenne pepper increases the internal heat of the body. In order to increase heat, energy is needed, and thus cayenne pepper contributes to increased metabolism. Cayenne has been used to improve blood circulation in traditional Asian medicine as well as in the Indian medicine of Ayurveda. Improved blood circulation means reducing the formation of blood clots that cause heart attack or stroke. To improve blood circulation, some herbalists suggest taking a quarter-teaspoon three times a day in water, or placing a poultice made with cayenne to boost circulation in a troublesome area. Eating spicy foods, which contain capsaicin from hot peppers increases blood flow throughout the body, and this is why many people become flushed when they eat certain spicy foods. Capsaicin can affect the tissue lining mucus membranes in the sinus cavity. It thins mucus in the nasal passageways and sinuses, making breathing easier when you have a nasal congestion caused by an infection or a common cold. Go here to learn how to make the potent recipe to kill a sinus infection instantly. In a home where there is anyone with a heart problem, or high blood pressure, keep a bottle of cayenne pepper handy and that could save a life. Get acquainted with the warning signs of an impending heart attack: chest pain, throat or jaw pain, shortness of breath, heartburn, lightheadedness, cold sweat and unusual tiredness. Cayenne pepper helps to facilitate better blood circulation, improving blood flow to the brain, strengthening heart beat and preventing adhesion of platelets that can cause blood clots. Blood clots are deadly in individuals with high blood pressure as it can lead to stroke or aneurysm. You can administer cayenne pepper to an individual who is still conscious during a heart attack by giving them a drink of warm water mixed with half a teaspoonful of cayenne pepper. If the heart attack patient is unconscious, and while waiting for help, put a few drops of cayenne pepper tincture or extract under their tongue. Hot pepper powder or any other chilli powder may not work as well. They differ primarily based on heat. 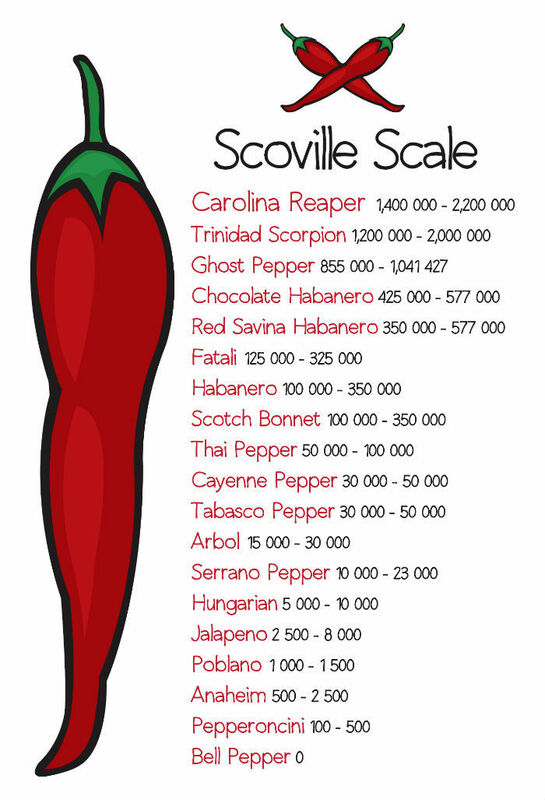 Scoville heat units (SHU) is the most popular method of scoring peppers based on their level of spice. Cayenne pepper generally ranges from 30,000 to 140,000 SHU. American cayenne is more commonly found in grocery stores and is generally in the 30k-50k SHU range. African birdseye cayenne is much more potent, extremely hot, and should be taken with caution, especially if you are new to cayenne. Cayenne pepper can have a range of color, from yellow to a reddish-brown. For the health benefits of cayenne, you want to buy pepper that is a bright orange or red color. The more orange, the more beta-carotene and vitamin A is present. In order to get the benefits of cayenne pepper, it must be at least 30-50k SHU. The SHU score is directly related to the amount of capsaicin, which is the compound that provides the disease and inflammation fighting benefits. It is important to use organic cayenne pepper to ensure that your product is chemical-free and has not been irradiated. Most American cayenne can be found at your local grocery stores, however, your best bet is to go to your local healthfood store. “Simply Organic” is a brand I trust when it comes to spices. Users swear by its quality and effectiveness. You can read the reviews here, and get a bottle or two. Cayenne pepper is easy to use and can be incorporated into almost any meal or even dessert. If you are new to spice, start off small. As you build a tolerance for heat, you will be able to add more. Cayenne pepper is available as a fresh or dried pepper, ground spice, in capsule form and creams for external use. 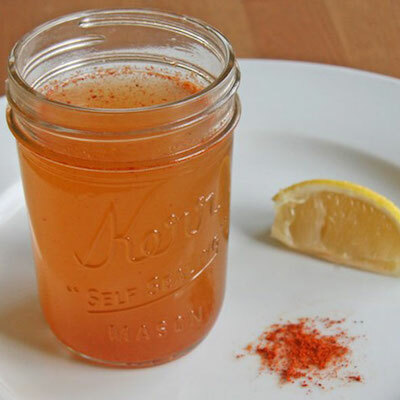 You can drink cayenne pepper tea: Add ¼ to ½ teaspoon of cayenne pepper steeped in a cup of hot water. You can add ¼ to ½ teaspoon to your food, or stir it into juice, tea or milk. Capsaicin isn’t destroyed by heat, so you can use it in cooking as well. According to the University of Maryland Medical Center website, topical applications contain 0.025% – 0.075% capsaicin and may be applied directly to the affected area up to 4 times a day. Pain may get slightly worse at first, but then may get better over the next few days. Capsaicin should be applied regularly several times a day, and it usually takes 3 to 7 days before you notice substantial pain relief. Cayenne pepper can interact with certain medications (such as aspirin and blood thinners). Therefore if you are currently taking medications, talk to your doctor before you include large amounts of cayenne pepper in your diet or take cayenne supplements. Eating too much cayenne pepper can result in stomach irritation as well as stomach pain. Don’t apply capsaicin cream to cracked skin or open wounds. Eating cayenne in food is considered safe during pregnancy, but pregnant women as well as breastfeeding women, should not take cayenne as a supplement. Good quality organic cayenne pepper is a fun spice to add to your cooking repertoire. It adds flavor and packs as many health benefits as it does heat. Try adding a little cayenne into your next meal or snack, you’ll be surprised at the extra dimension it will add to your food! Using cayenne pepper everyday raises your white blood count. When your doctor reads your blood test, he thinks you have some kind of infection. This is caused by using cayenne pepper everyday. It happened to me. Hi Henry, thank you for sharing! Having white blood count from using cayenne pepper is not a bad thing. It promotes an increase in your white blood count to defend your body against germs or bacteria, viruses, fungi, parasites, cancer cells, and allergens. Therefore, taking cayenne pepper when you have any pain in the body, will help to reduce the inflammation. Admiring the dedication you put into your site and detailed information you provide. It’s good to come across a blog every once in a while that isn’t the same outdated rehashed information. Excellent read! I’ve bookmarked your site and I’m adding your RSS feeds to my Google account.